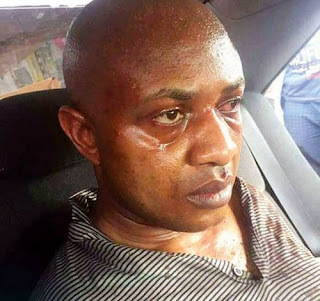 Suspected billionaire kidnapper, Chukwudumeme Onwuamadike aka Evans, yesterday told New Telegraph reasons why he did not operate in South-West states apart from Lagos. This was even the police yesterday said the suspect would soon be charged to court on charges of alleged murder, kidnapping and armed robbery. Evans said he preferred to operate in Enugu, Abia, Lagos and Edo states. But, according to him, since he is from Anambra State, he decided not to carry out robbery or kidnapping operations in the state. He said: “Police tracking located me in Anambra State, but it was not because I committed robbery or even kidnapped anyone there. Challenged that he once carried out simultaneous robbery operations in Oyo State in 2010, where three banks were raided, Evans shrugged. “No! I have never operated in any Yoruba state, let alone Oyo State. I have never operated there; Lagos is my state. I mostly operated from Lagos. Moreover, I also didn’t like operating in Yoruba states because I don’t know my way around there. I don’t know the terrains. It is not right to go where you don’t know, except you have someone that can lead you,” he said. Evans also seized the opportunity of speaking with New Telegraph to dispel outrageous ‘lies’ being peddled in social media and online sites. Yesterday, the Force Public Relations Officer (FPRO), Mr. Jimoh Moshood, said investigations into the alleged crimes against Evans and his gang members had reached advanced stages. He added that the judicial process for his conviction or otherwise, will “soon begin before a court of competent jurisdiction”. When asked where the billionaire suspect would be tried, in view of the fact that he had committed the alleged offences in different states.